Finally! Everybody has signed up for medical care insurance. Save that sigh of relief, though, for your next physical (you'll be prompted to "breath out"). And don't go alone. Bring your smartphone. Your doctor won't treat your smartphone but it can be a very handy thing to have in the exam room, whether you're the patient or just accompanying the patient. And accompanying the patient is, by the way, an excellent idea. In the course of the always-too-brief consultation, you'll pick up things that the patient has missed while absorbing some key point. Later, you can help reconstruct the discussion. Of course, your smartphone can do that all by itself just by recording the conversation. We've been recording consultations for one or another relative since before there were smartphones, in fact. It's particularly helpful when meeting with a new specialist like a heart surgeon or an oncologist. The first benefit is getting a second shot at hearing all the new terms being thrown at you. The second is getting an instant reply on your options, including the benefits and side effects. An awful lot of that can get lost if you just try to remember what was said. We haven't met a doctor yet who minds having the conversation recorded. The poor devils have to repeat themselves so much they welcome anything that captures their pearls of wisdom in one shot. But do ask. Believe it or not, more and more medical offices are discovering the efficiencies of the computer revolution of the last century. The manila folder isn't extinct but the big monitor has made it into the exam room where the doctor can display an X-ray while explaining the problem and solutions. The turnaround these days for X-rays is so quick maybe we should call them Instarays. By the time you return to the exam room from the X-ray, the digitized image can be transferred to your medical file where your doctor can pop it up on the screen. 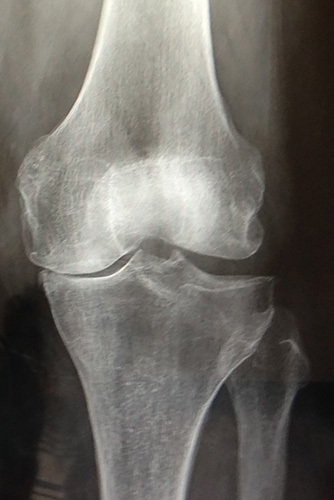 The X-ray of a knee with osteoarthritis shown here was displayed on a 27-inch Mac monitor. You can see the bones touching on the left where the meniscus that should be separating them has worn away. Talk about an image being worth a thousand words. And we don't just mean a thousand words to describe what you see. We mean a thousand words to discuss what you see. In this case, the image prompted a discussion about an option to surgery that had not been offered simply because of the patient's age. Later, of course, the image captured by your smartphone can describe the problem better than you can to other family members or friends. Although we do still wonder about the three pants zippers revealed with the hip replacement X-ray one friend recently sent us. After we grabbed this shot (which has been significantly cropped) on an iPhone 5c, we emailed it to ourselves so we could share it with other people who needed to know about it. No point in leaving it trapped in the phone. Especially since it wasn't our phone. This is certainly something someone accompanying the patient can busy themselves with during the exam or the patient themselves can do while waiting for the doctor or nurse to return to the exam room. During lulls in the conversation, that is. Otherwise, keep that voice recorder on. It may not be the sort of selfie that gets shared several million times, but it may be the most important one you ever take.